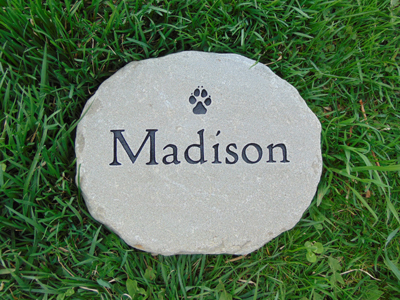 Our medium garden stones are shaped from our more tan/brown bluestone. 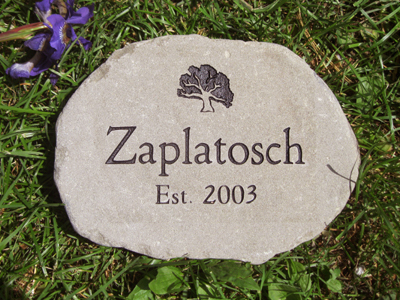 We shape our "garden" style stones to be rounded on the bottom. They are 2" thick and 10-12" across. 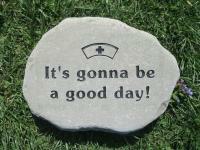 You can personalize your stone with up to two lines of text as well as any graphics you would like. 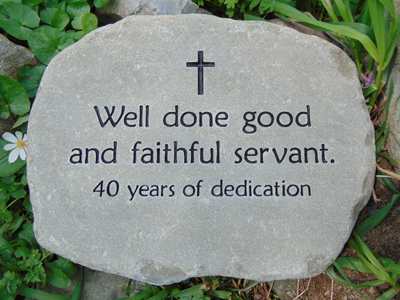 I just wanted you to know that I am delighted with the stone. 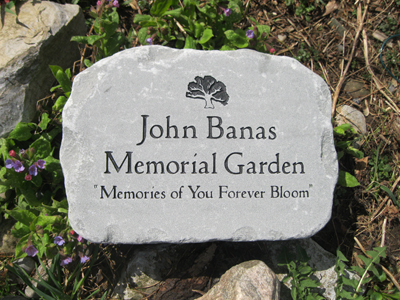 It is just perfect at the base of the tree in memory of our friend. 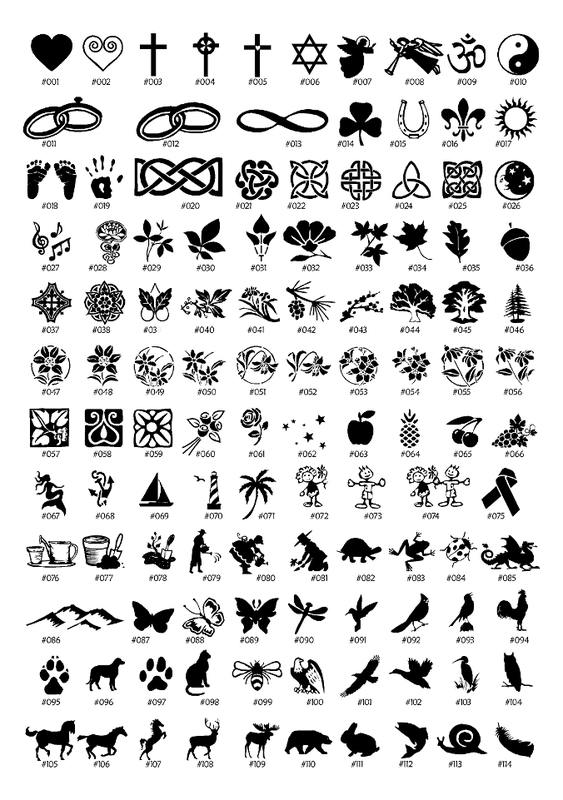 Thank you for your suggestions as to font and graphic and for your prompt attention and delivery of the order. I will be happy to recommend you to my friends! 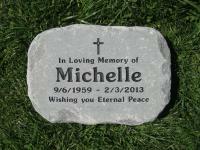 The family that I ordered the Memorial Stone for has received it and absolutely loves it. I also appreciate the help your sales rep gave me on looking for a special graphic that I wanted to honor this person's life. 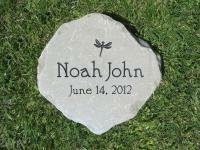 I will continue to order from your company instead of flowers for Memorial gifts since they are so lasting. Thank you again. Thank you SO much for making this beautiful stone! I was thrilled with it when I opened it and couldn't wait to give it to the Baltimore Ronald McDonald House to say " Thank You"! They loved it and said it was one of the best/most special gifts they have ever received! 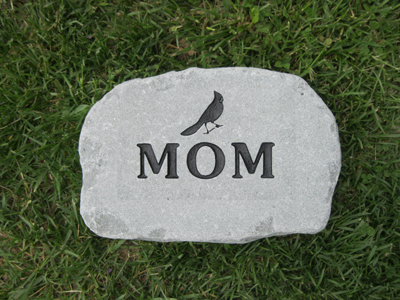 It has been placed right when you walk out the back door for all to see ( it leads to the sitting and playground areas). Thank you for this beautiful and special gift and I already know I will be ordering something for myself in the future! 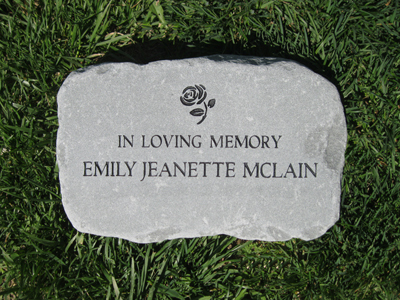 We today received our memorial stone for our co-worker...Beautiful, and incrediblely fast shipping.Wow! This is a beautiful piece of work and we are so happy to used your company. Would definitely recommend you. Thanks so much.